Имате въпрос към Punggol Ranch Resort? Независимо дали сте турист или пътувате по бизнес, Punggol Ranch Resort е перфектен избор за настаняване в Сингапур. Вълнуващият център на града е само на 19.7 km оттук. Хотелът предоставя също лесен достъп до безбройните градски забележителности и атракции като The Punggol Settlement, Waterway Point Mall, Pulau Serangoon. Punggol Ranch Resort също така предлага много съоръжения за обогатяване на Вашия престой в Сингапур. За удобството и комфорта на гостите хотелът осигурява ежедневно почистване, паркинг, семейна стая, барбекю съоръжения, ресторант. Насладете се на висококачествените удобства по време на престоя си тук. В някои стаи са на разположение телевизор с плосък екран, стаи за непушачи, климатик, бюро, DVD/CD плейър, които ще помогнат на гостите да релаксират след дългия ден. Независимо от това, дали сте фен на фитнеса или просто търсите начин да отпочинете след уморителен работен ден, в хотела ще намерите най-висококачествените съоръжения, такива като конна езда, градина. Punggol Ranch Resort е добър избор за всички посетители на Сингапур, защото предлага спокойствие и безпроблемен престой. Обектът изисква заплащането на възвръщаем депозит на сума от 100 SGD при настаняване. Guests arriving after 08:00 PM are required to provide an estimated check-in time to the property before 08:00 PM. Thank you for your feedback, and we will try to improve our hospitality in order to servers out guest better in future. This is my 3rd stay here celebrating birthday functions. I was the first one in my family to find out about this new place. Then on I have been recommending this place to everyone. Even this coming Saturday 2/5/2015, My Brother is holding his Birthday celebration here. Since my 1st visit, rooms are getting filled up quite fast that last minute booking is to no avail. After 8pm there will no longer be reception. Don't forget to bring along $100 in cash for a refundable deposit. 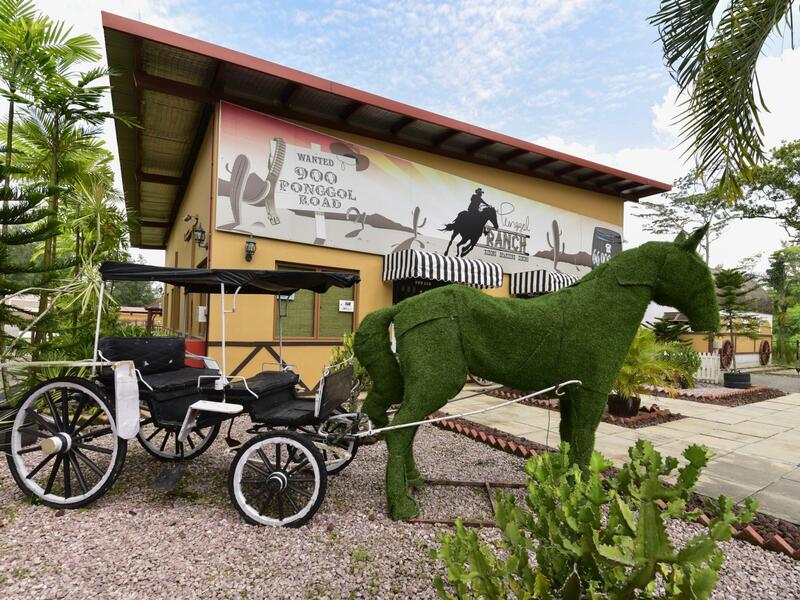 You will be given 2 complimentary horse riding tickets upon check in. There are Giant supermarket, 7 eleven and food outlets all just a 5 min walk out the park. Bear in mind, all shops close at 10pm. Even 7 eleven. There is vending machine at the resort. Overall had a plasant stay and will stay again and again. Awesome stay with groups however we found out that we had to pay for the bbq pit which was a bummer. Furthermore was looking forward to the stable ride but due to an accident, it was suspended and replace by a stable tour instead which was disappointing as it is not an equivalent experience in my opinion. Could have offered more options. Friendly staff, efficiency in replying emails to me and staff very helpful when i requested to have what im catering for. Pleasant stay with nice surrounding.. jusr a little comment that will help the place. Alot of sandflies and some of the area like west well we booked the area for Bbq and the place is dark. We cannot even c our food got burn.. try to have more activities and swimming pools... other then dat the place is awesome.. Enjoyed it very much. However it will be great to provide complimentary coffee n tea,mineral bottled water for guest. Tv reception is very poor. We had a gd time wt bbq outside the comfort of our wagon. Will definetly stay again. I've called in many times but only twice were my calls being answered. Both times I ask if we were to pay anything to use the BBQ pit, and both times they said no, and that's it's free. However, upon check in, they said I need to pay $10 for the metal container to hold the charcoal!!! And I ask about check out timing, over the phone, the lady said its at 11am. I request for late check out, she said its chargeable at $20 per hour. So I told her don't need. When I check back on the hotel policies on agoda, check out timing is at 12pm. Staff are definitely not aware. Furthermore on the day of checkout, the office was locked! No way to check out at all since they hold a $100 deposit from us. We waited for almost an hour. Next thing to note, the BBQ pit area is really swarming with lots of big fat houseflies. Hence it is not ideal to have the food placed outside. You will definitely need to keep all food inside or otherwise covered. No rubbish bin is provided, so please prepare trash bags. The phone in the room is dummy, and cannot be used at all. No room service too. Fridge is typical size and is sufficient to put some food in, along with the freezer compartment. Good place overall. 2 free horse riding tickets for each chalet rented. Allows as many people to stay in one chalet as long as you are willing to squeeze. Recommended for bbq and celebration. Only drawback is bbq pit is 10 dollars per pit and also furniture is old. Be careful when you sit on the chairs. The back of it came off for one of them, and the nails are exposed. Can be dangerous if you are not careful. TV proggrammes very standard no much to have.. Maybe weather to hot so air-con not cold .. Should have free breakfast so morning have good coffee.. Eggs .. Bread .. Instead of telling the guests have 10% discount if we eat at the restaurant. Tell more about area..
Cleanliness, Good staff & big room. The room was clean and big. Has request the BBQ to be in front of the entrance but was not provided and there are several empty rooms with BBQ in front of the entrance. Difficult access to BBQ pit. No rubbish bin to clear the BBQ rubbish. No lighting for BBQ. 1) Less crowd, 2) New as in Spore. This was my 2nd stay, and there was a DVD player control, when previously I asked, they brushed me off by telling me there isn't any, and this time the room was missing a fringe. Even though I really enjoy my stay here, I was pretty upset with the lack of help from the staff, and the joy rides had a long wait. On the bright side, the food at the western restaurant near the front desk serves really good food. My first visit here, was pretty pleased at the special feeling of staying at a place that wasn't noisy with a lot people. They had two restaurants located at their Resort, which served pretty good food. Just a short walk away, you can find restaurants, a nice walk along the sea, and a convenience store. The only downside was that their Dvd player had no remote control, and their front desk closes really really early, and there was this hotline to call after 8pm, but the person in charge wasn't very helpful, he just gave answers that made his life easier. They also had a blackout when it was raining at 2.30am, which they didn't apologise for. It was the most relaxing and wonderful stay overall. Best place to unwind and relax without having to go overseas. Only complaints we have is they don't serve HALAL food. Both restaurants are non - halal. Would be nice if the indian restaurant offer halal food so we don't have to go out to find food. - Little huts resembling wagons with touches of "horse" furnishings and a fireplace. - A porch with bbq facility. - A place for pony/horse riding. We had a pleasant stay at the resort. The children loved the fireplace and it looked lovely at night. It was good for a one night stay as activities are limited to pony riding and pony feeding for young children. There is a porch for each wagon and it is good for bbq with a small group of friends and family. F&B is limited in the resort. Breakfast is limited and pricey at Bacon and Booze. Very pleasant. Resort room was large and clean but not luxurious, but I already expected that. The pony rides were fun for kids. Punggol town is nearby, so for those who drive, food is not a problem. They do have an eatery at the resort, but we opted not to go there because we were there on a weekday and the place was almost deserted. If you're looking for a different experience or stay cation in Singapore, then this is an acceptable option. Your child gets to go on a few horse rides, a decent play area and some decent restaurants nearby over looking the sea. Nothing noteworthy about the accomodation. Just basic ammenities. My girl like it. One night is enough.